Thunderbirds Pinball machine is based on the hugely popular UK science-fiction television series and lovingly recreated by Homepin as a modern pinball machine. 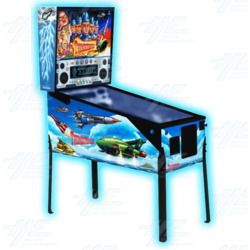 Unlike other machines available, the Thunderbirds Pinball machine will not have optional extras and will include items such as coin mechanisms and shaker motor as standard. We are seeking professional agents to partner with us to grow the Homepin brand. If this sounds like you, please contact our team for full details.